Sonically founded in bluegrass, jazz and American acoustic music, the virtuosic collaboration between esteemed mandolinist Matt Flinner, guitarist Ross Martin and bassist Eric Thorin is a finely tuned compositional machine. Over the last eight years, the trio has been writing new music the day of any given show and performing it as part of that night’s concert. 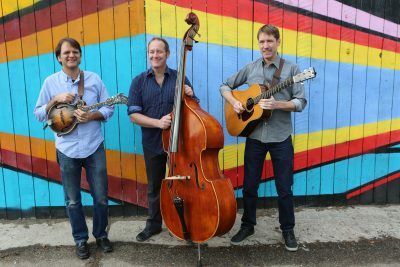 The resulting push to constantly create new material and challenge themselves to find new sounds and textures has led the trio to a unique sound all their own, and has also stretched the boundaries of what a bluegrass trio can do. Now with over four hundred tunes in their repertoire, the trio continues to explore new sounds as they write for guest artists such as Sam Bush, Stuart Duncan, Dave Douglas, Tony Trischka, Darol Anger and many others. Watch for a new CD featuring many of these guests in 2019!